Dozens of abandoned hillside farms litter the valley sides in the Upper Calder Valley, West Yorkshire. This is an unyielding barren landscape and many of these farms are in the remotest locations, reached only by picking one's way miles along overgrown tracks and open boggy cotton moorland grass. Electrification arrived in the 50s but most of these farms had been abandoned before then with a decline that accompanied the desire for better wages and living conditions in the towns and cities with the Industrial Revolution and accelerated through to the decades after the war. Until then, lives for generations were eked out by cultivating oats and potatoes, having a flock of sheep and maintaining a family cow. A dual household income was derived from hand loom weaving and then latterly, with female and younger family members working within the local worsted and cotton industries. With a current photographic vogue for capturing dereliction, it would have been easy to photograph these "romantic ruins" and walk on without engaging emotionally, but my own agricultural roots and sensitivities have compelled me to produce what is in essence a social history document that reconnects man's history and farming endeavours with this dramatic Pennine landscape. By establishing where possible, who the last occupants of these farms were, I hope to illustrate the pattern of ownership and rapidity of decline once abandonment has occurred. 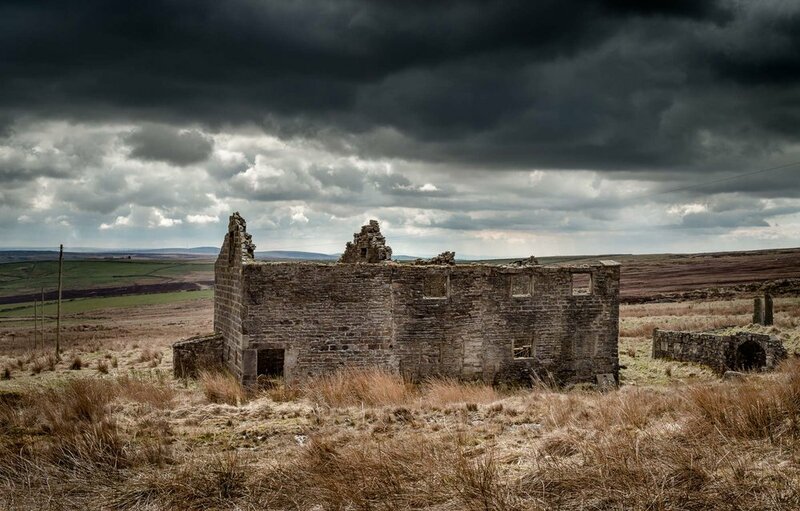 This poignant building narrative, limited in its outcome by listings and planning regulations that prevent renovation, can only proceed in the direction of continued crumbling decline hastened by the harsh climatic elements…ultimately rendering the farm a tombstone in the moorland landscape... a reminder of difficult lives lived, and despite current pressures for housing stock and land, unlikely to be ever repeated.